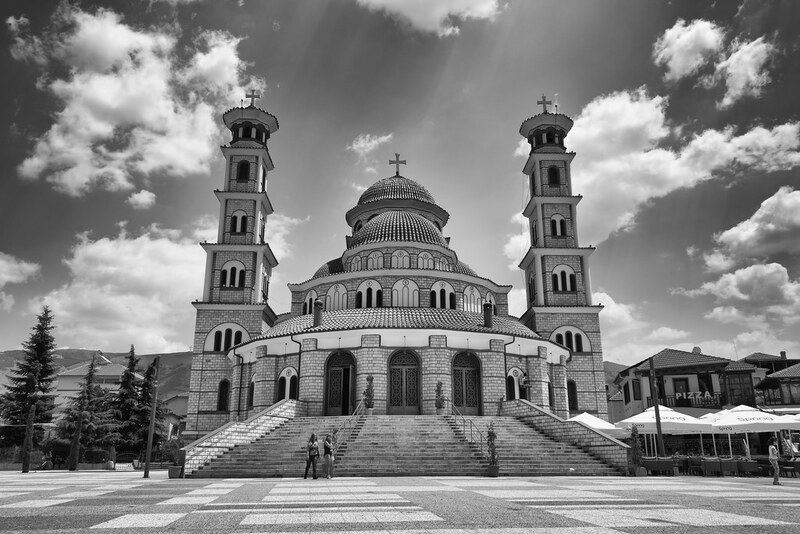 A small Balkan tour: Part 1, Mountains, Donkeys and Kokoretsi – Ouestef? At first Angela and I had wanted to cycle around Iceland, but the thought of potentially getting rained on during three whole weeks only mildly appealed to us. The Icelandic weather really isn’t that predictable, you know. Having traveled to South Africa last year, this time we also wanted to visit somewhere a bit closer to home. 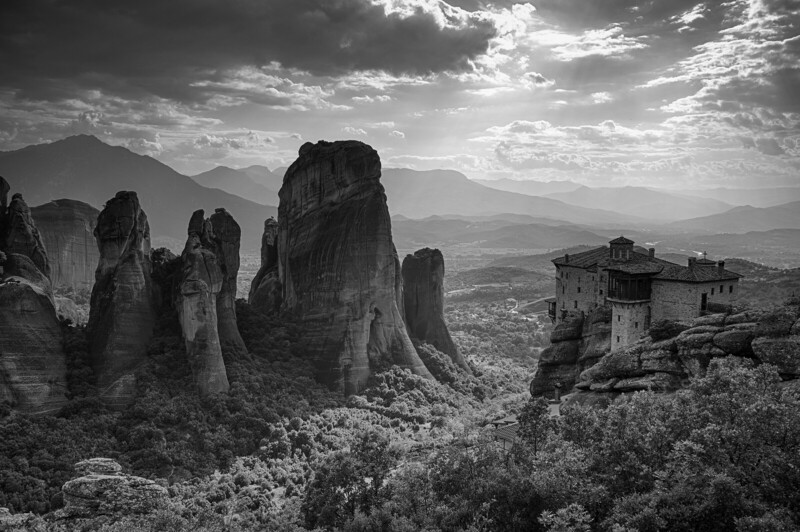 Initially I had planned to cycle from the north of Greece down to the Peloponnese peninsula to visit my friends Chris and Vicky. But then as I looked at the map of the Balkans to plan the route I noticed Albania sitting right on top of Greece. 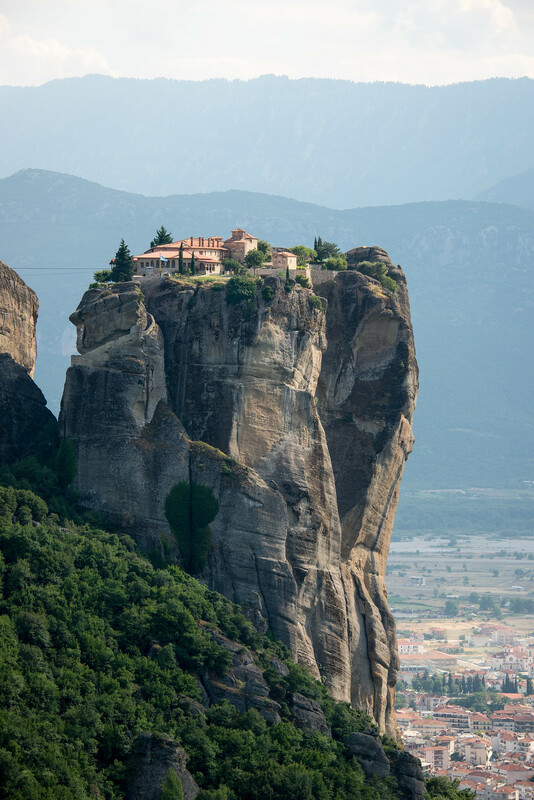 After a quick online search I realised this small and unfamiliar country had a beautiful coastline, high rugged mountains and many interesting places to visit. But most important of all, it looked authentic and still unspoiled by mass tourism. The perfect ingredients for an interesting cycle adventure. Convincing Angela to join me wasn’t as hard as I thought it would be. Her first reaction was of course understandable: “Why in the name of Jane Goody would anyone want to go there?” she erupted. 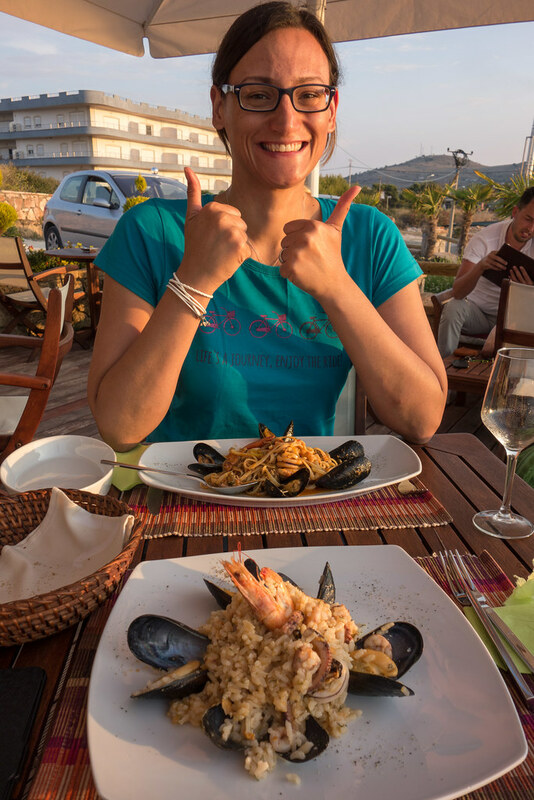 But as soon as I described the turquoise waters of the Ionian Sea, the quiet beaches of the south west and the ridiculously cheap and hopefully delicious Mediterranean food, she was on board. What I deliberately forgot to mention, of course, is that 60% of Albania is covered by mountains. You see, Angela hates (with a passion) any kind of cycling up a hill unless there’s a glass of wine waiting for her at the top of it, preferably served by the side of a swimming pool. 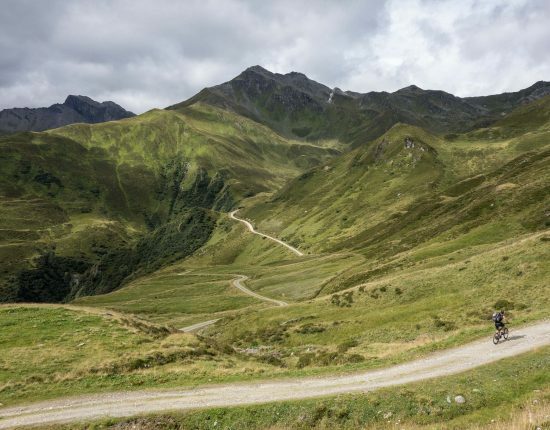 In her eyes mountain roads are just a succession of exhausting uphills followed by frightening downhills. “Why can’t we just go around?” is generally her first comment when she realizes our route is heading straight towards anything above sea level. “Better let her find out on her own once we’re over there.” I thought, making a mental note to ensure I was far enough ahead of her at that point to avoid the abuse coming out of her potty Essex mouth. 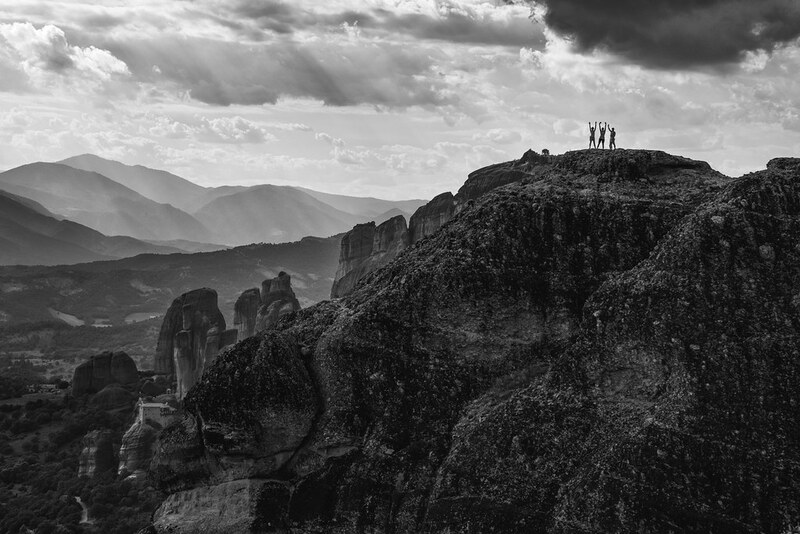 The mountain turned out to be much harder to cross than we expected and the temperatures much higher than we could bare, but in the end we spent three wonderful weeks in Albania, not forgetting a little detour in Greece and Macedonia. 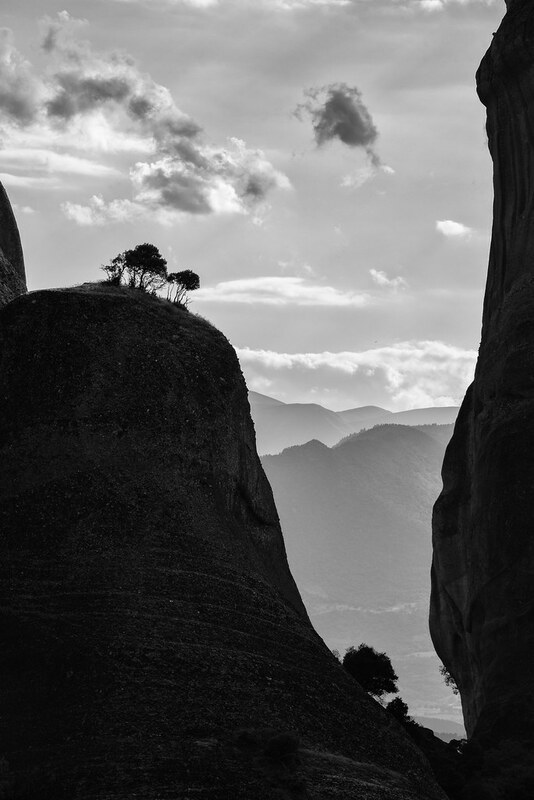 We met some very friendly and inspiring people, enjoyed some beautiful landscapes and consumed more feta than an average Greek family does in a whole year. 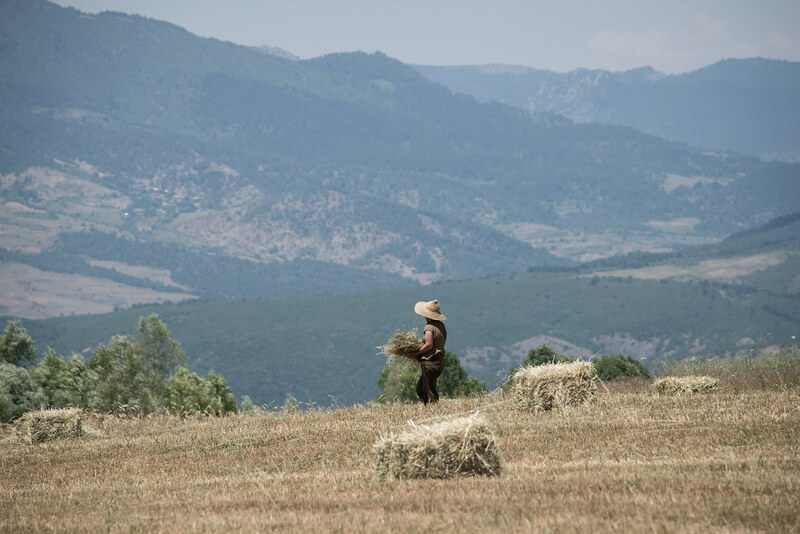 The following is a photo diary of our Balkan journey. 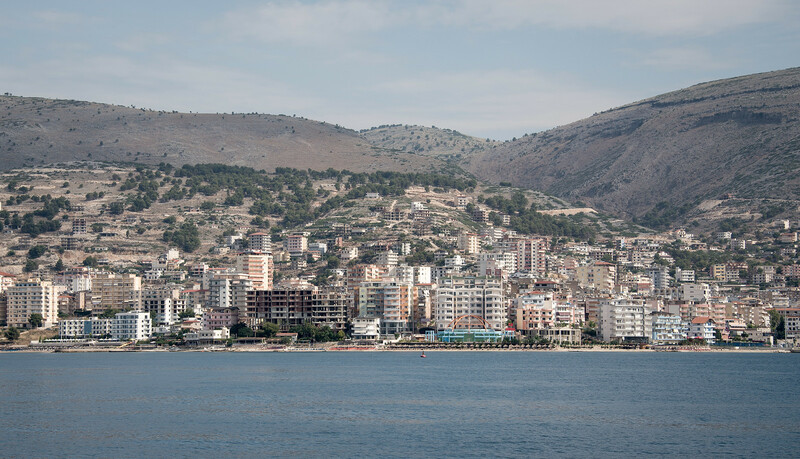 Our first glimpse of Sarandë, the starting point of our cycle tour. From Saranda we headed straight south to a little town called Ksamil. We had decided to spend a couple of days resting on the coast before exploring the country on our bikes. It was a holiday after all and Ange was determined to get some quality time on the beach before we did anything else. It was clear that the main holiday season hadn’t started yet, since we were the only guests at the hotel for the two nights we stayed there. 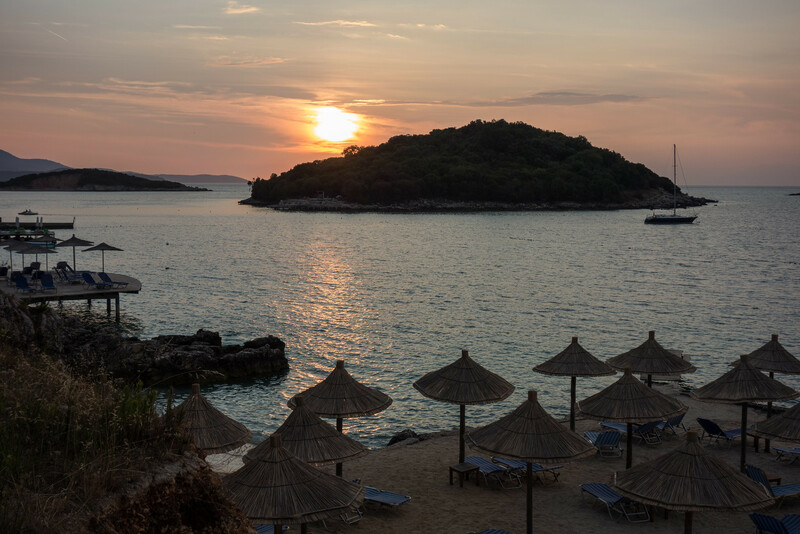 The friendly owners were an Albanian family who lived in Greece during the off-season and came to Ksamil before the tourists arrived. We spent both evenings with them, talking about our respective lives while drinking homemade raki and watching Albanian TV. Natalia, the eldest of the two daughters, was more than happy to practice her English with us and did a great job as a translator. Thumbs up! 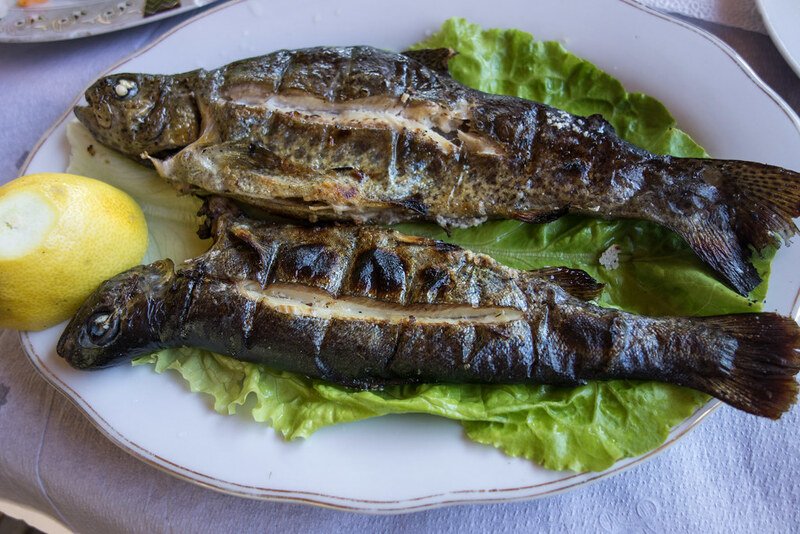 The seafood in Albania was delicious and cheap. 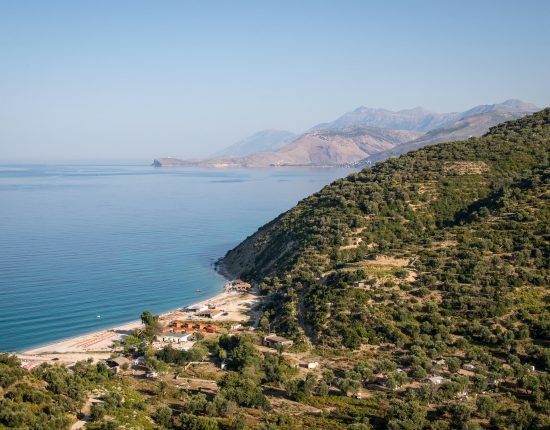 We left Ksamil and turned east onto road SH99 just before Sarandë. Our goal for the day was to cross the Mali i Gjerë Mountain Range over the Muzinë Pass (572m above sea level) and reach the city of Gjirokastër. Half way up the climb we left the main road and took a dirt track that led us to Syri i kaltër (also known as The Blue Eye), a natural water spring bubbling out into a deep turquoise blue pool. Unfortunately the dark clouds that had gathered over our heads turned the spring into a disappointingly grey color. To make matters worse it started pouring down as soon as we wanted to leave. Three quarters of an hour lately, once the storm had finally moved on, the dirt track was a muddy mess. The clay was so sticky that it collected around our wheels, to the point where there was no space left between the tires and the mudguards and the wheels simply stopped turning. I am generally pretty relaxed about everything, but this made me furious! “Stupid dirt road and stupid weather!” I thought… We ended up having to drag the bikes over the 2 km back to the main road, where I spent one hour cleaning them both in a little river. Bath time for both our bikes. By the time I finished the impromptu bike-cleaning session, menacing dark clouds had gathered over our heads once more. We hadn’t been cycling five minutes that it started pouring down again. We quickly hid under a tree, hoping that the downpour would be over soon but half an hour later we were still standing under the same tree, soaked to the bone. At this point a car pulled up right next to us (a Mercedes of course, Albania’s favourite car) and I thought the driver was going to offer us shelter on his back seat. He got out, threw a bunch of rubbish on the ground (Albania’s favourite garbage-disposal technique) and proceeded to switch around the only wiper that his windscreen possessed. It was of course more useful on the driver’s side than on the passenger side, especially in this weather. He then jumped back inside his automobile and drove off, not having once glimpsed in our direction during the whole process. There was no point staying under that tree anymore. We were drenched and cold, so we decided to head back the way we had come to a petrol station/restaurant combo that we had passed just after the turn-off to the Grey Eye. The owners invited us inside the dining area, where an Albania family was having lunch. The mother looked at us and asked, “parlez-vous français?” It turns out she had lived in Paris for 6 months, and had met such hospitable people there (was she really in Paris?) that she tried to be friendly to any tourists she met back at home. She bought us a drink each and we had a nice chat until they had to leave. Eventually the rain stopped and by the time we’d reached the top of the pass even the sun was out. The short and steep downhill led us into a huge valley with the Drino River flowing in the center of it. The view of the valley and the Lunxhëria Mountain Range on the other side of the river was fantastic in the late afternoon light. 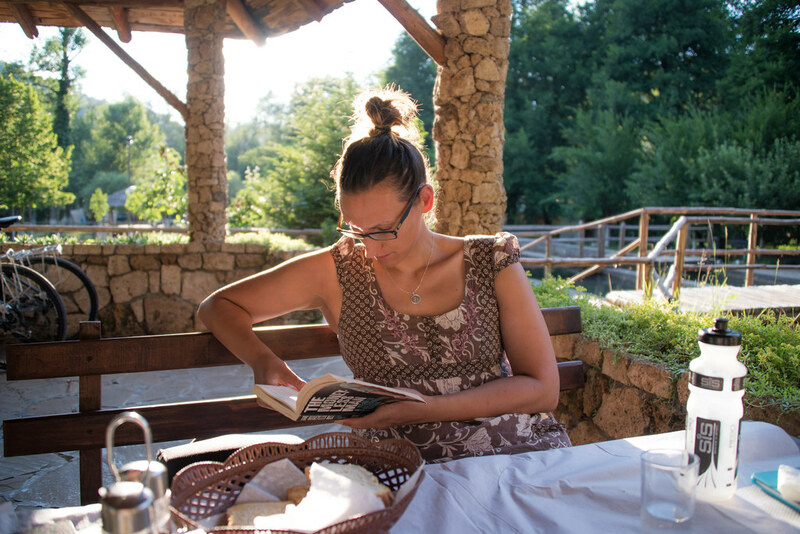 Angela enjoying a panoramic view of the Mali i Gjerë Mountains. 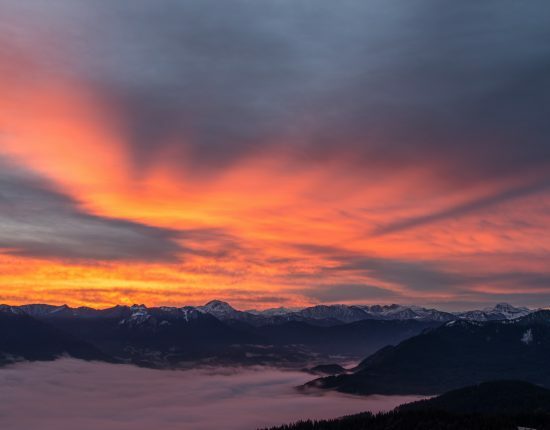 The Drino Valley and Lunxhëria Mountains. We arrived in Gjirokastër early in the evening, but not before getting completely soaked again under another downpour. 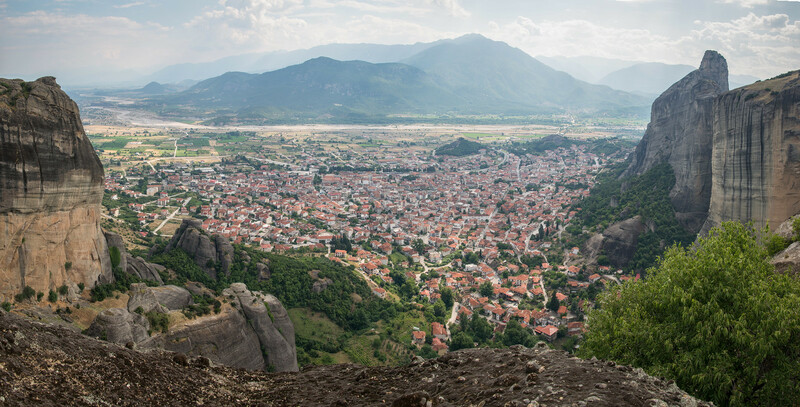 The city is built on the steep slopes of the Mali i Gjerë Mountain Range and I had booked a guesthouse that was situated almost at the top. Naturally Angela wasn’t very impressed. Luckily the elderly lady who owned the guesthouse saw us arriving through a window and quickly ushered us inside to a beautifully decorated bedroom and a warm cup of tea. She even collected our soaking wet clothes and gave them a spin in the tumble drier. What a first day! 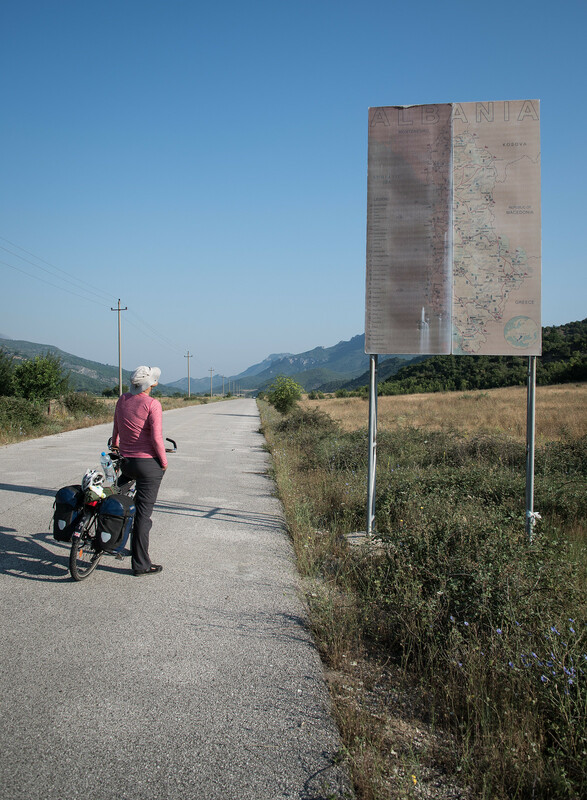 After Gjirokastër Angela and I followed the valley south towards the Greek border. 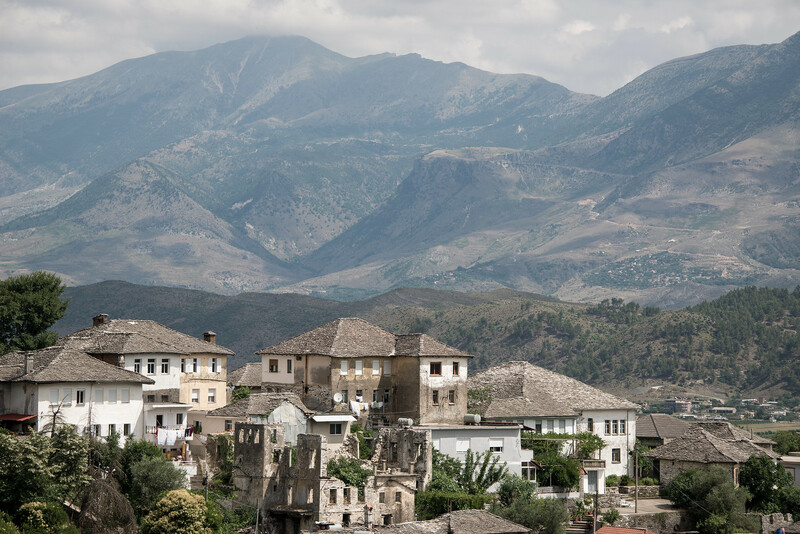 When planning our journey in Albania I realised that my friend and colleague Andreas, who is half Bavarian and half Greek, was going to be at his grandmother’s house in Kalambaka during the first week of our trip. 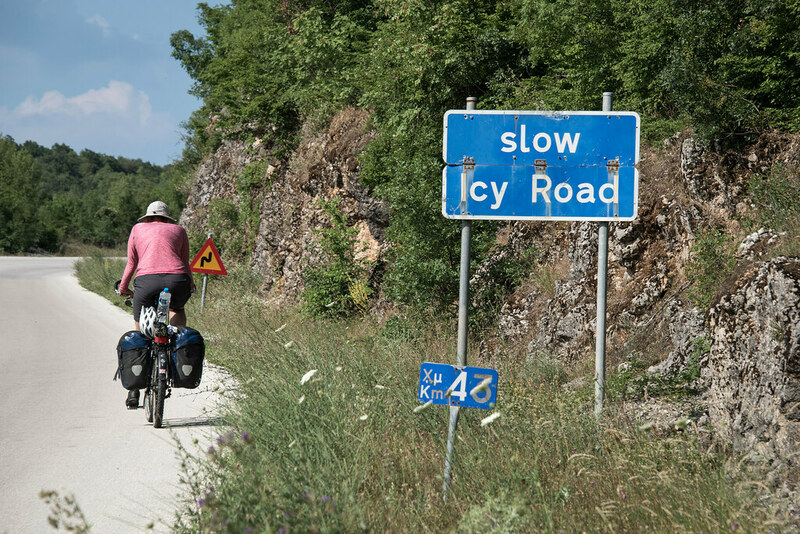 When I mentioned this to him her told me we should come and stay with his family; so I changed our route to include a loop into northern Greece. 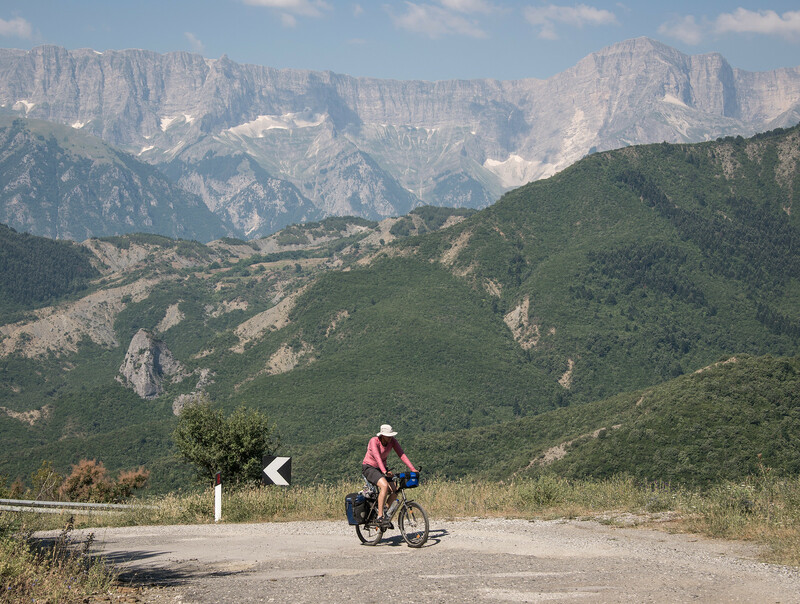 After a long and enjoyable day of cycling on quiet Greek backroads we arrived in the mountainous village of Zitsa, where we had arranged to stay with Warmshowers hosts. Anna and Kostas, an America-Greek couple who own the only bakery and the only bookshop in the village, welcomed us in their lovely little apartment. 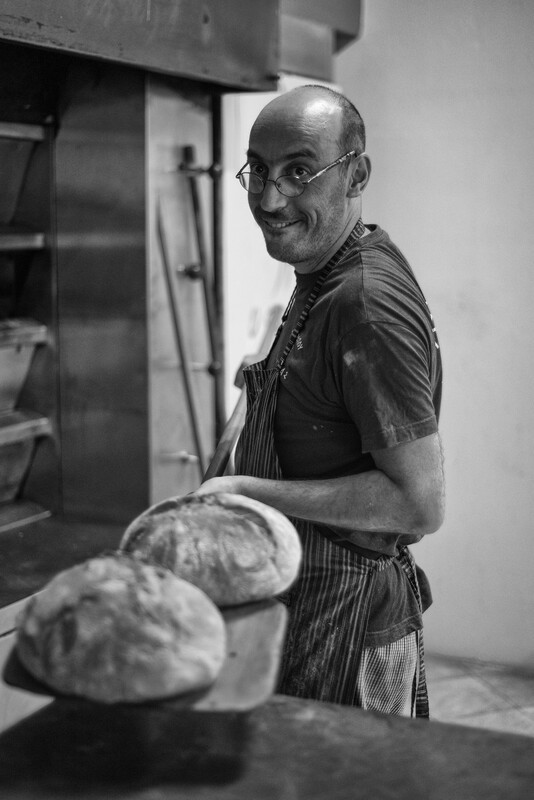 We had a wonderful time with them, and I even managed to get out of bed at 6AM the next morning to observe and help (mainly observe) Kostas prepare and bake his daily bread products. The smell all morning was incredible and the different baked goods that Kostas kept feeding us simply delicious. We caught an early bus from Zitsa to Ioannina the next morning and from Ioannina another bus to Kalambaka, where Andreas’ family welcomed us heartwarmingly. 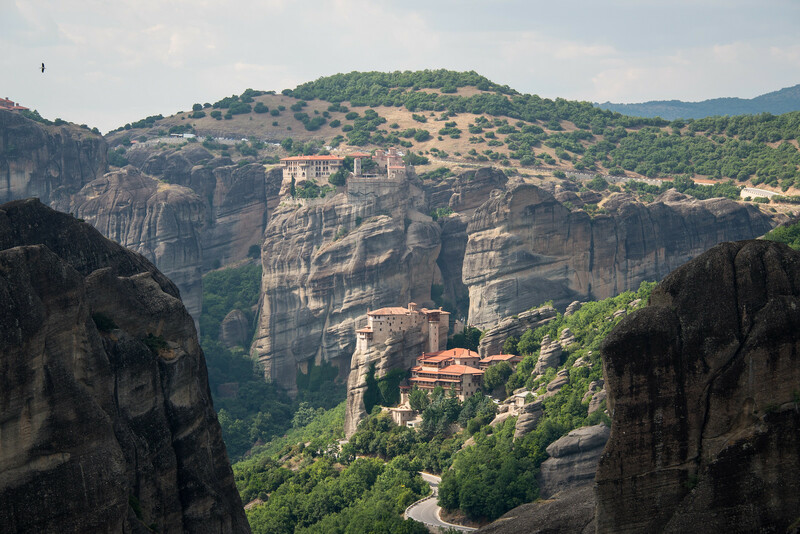 The highlights of our stay in Kalambaka were without a doubt visiting the Meteora Greek Orthodox monasteries built on incredible natural sandstone mountains and seeing Andreas’ grandma prepare kokoretsi, a traditional dish of the Balkans apparently banned in restaurants by the EU. It’s basically a variety of different lamb or goat organ-meats (kidneys, hearts etc.) threaded on a long skewer and wrapped with intestines. 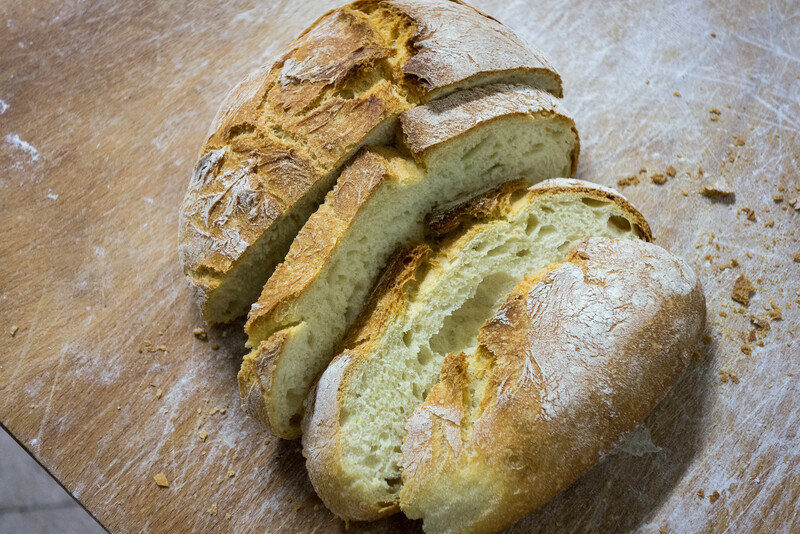 It sounds and looked quite nasty but actually tasted nice once roasted on wood fire. 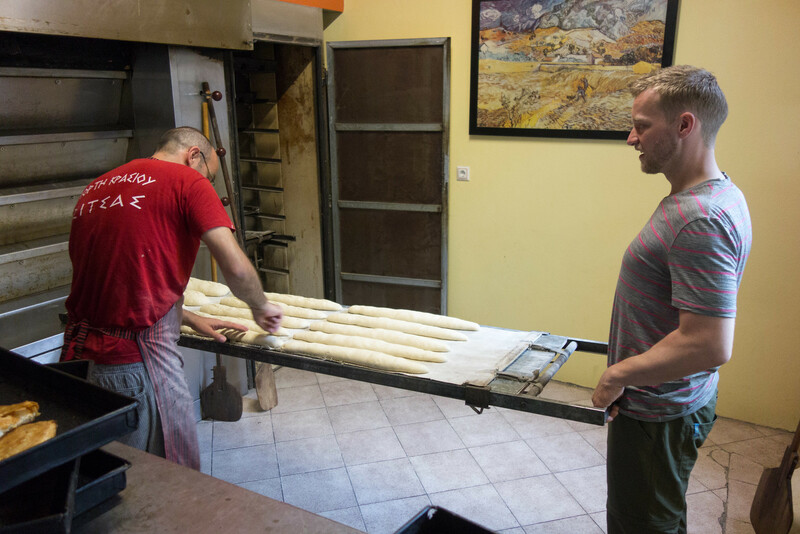 Helping Kostas in the bakery. Andreas helping his granny prepare kokoretsi. A breathtaking view of the Meteroa Monasteries. Climbing the unique rock formations that make the area so famous. We took a bus back to Ioannina, where Kostas kindly picked us up and had a last lunch with him and Anna before hitting the road again back towards Albania. 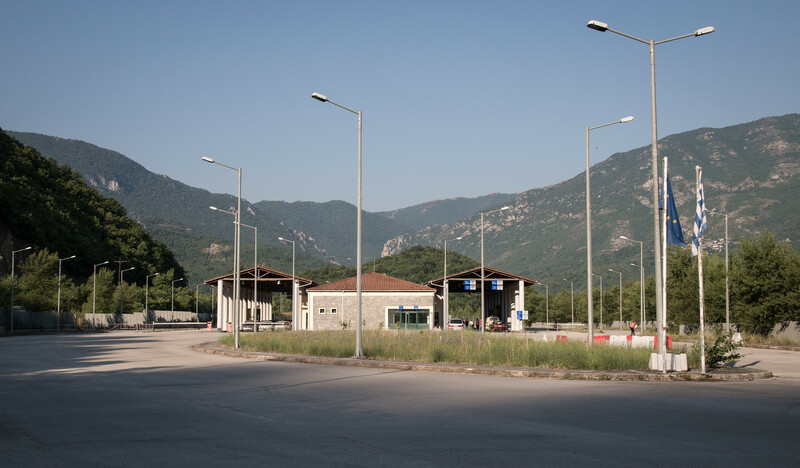 After a night wild-camping by a spring we arrived at the Melissopetra border crossing early in the morning to find the place deserted. From a distance we saw a queue of cars and assumed they belonged to people trying to cross the border. But once we pulled up alongside them we realised that they were covered with a thick layer of dust and most had flat tires. It must have been the queue of impounded cars… For a second we panicked, thinking that this particular border crossing was closed, but soon a man in uniform poked his head through a tiny window and invited us inside to have our passport checked. 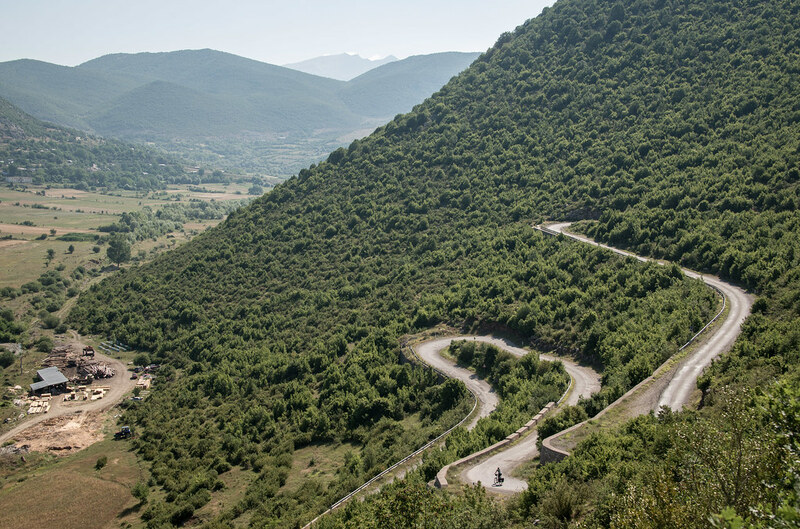 The Albanian formalities on the other side of the Vjosë River were completed just as quickly and soon Angela and I found ourselves riding back up the quiet and winding roads of the Gramoz Mountains. We enjoyed a long lunch break in the remote town of Leskovik before finishing the day early at Farma Sotira, a farm that offered camping spaces. Both Angela and I really enjoyed the vibe of the place. It was peaceful and beautiful, surrounded by mountains and trees, fish ponds, sheep, cows and horses. The tavern and the patios in the middle of it all were the perfect place to enjoy a beer and a book after a hard day of cycling. Later in the evening we were told that there were only two items on the menu, fish or lamb. We both chose fish and one of the two men running the farm walked over to one of the ponds, caught half a dozen fishes which he threw on the grass, proceeded to select the nicest four, threw the others back in the ponds and disappeared in the kitchen. A quarter of an hour later he came back with two plates of delicious smelling fried fish, tasty looking fries and of course some feta. One of the best meals of the trip. One of the quietest border points I have ever crossed! 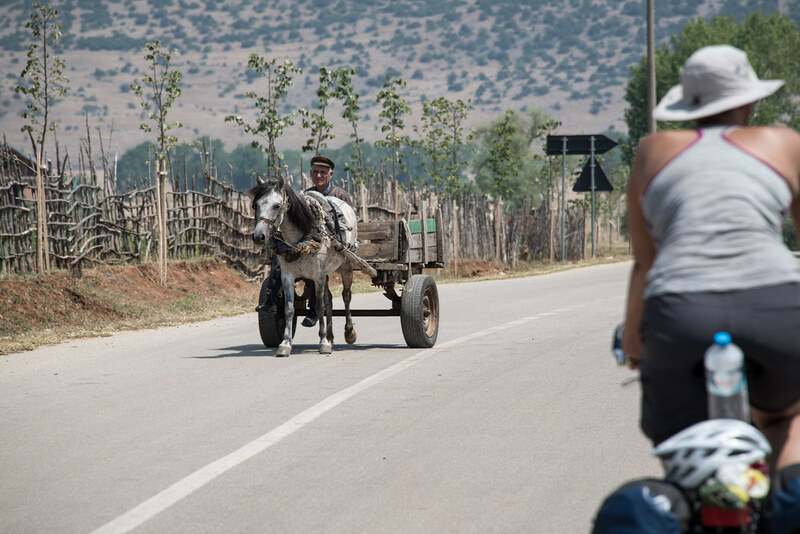 Back in Albania on empty roads. The remote town of Leskovik. Enjoying the relaxing atmosphere of Farma Sotira. 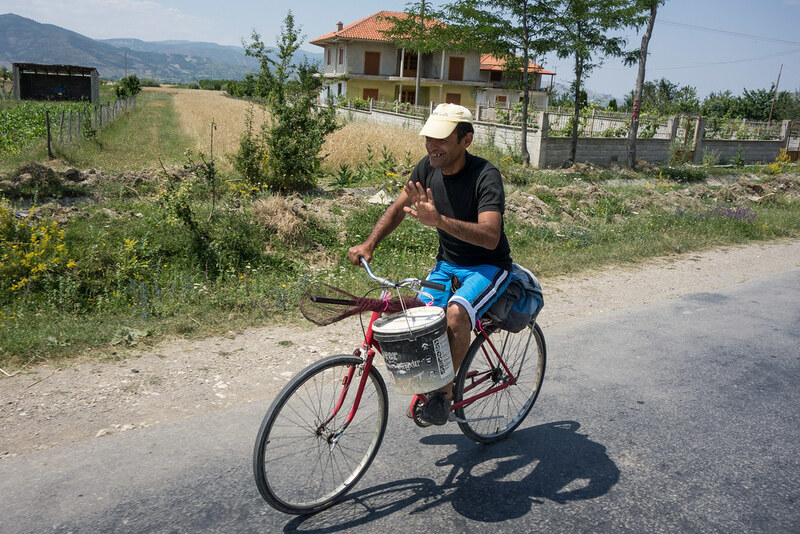 Another hard day of cycling on the very scenic road SH75 took us to Kamenicë, where we’d booked a quaint-looking little hotel. Angela cycled extra fast that day, and when I saw the outdoor swimming-pool upon arriving at the hotel I understood why. She liked the place so much that she convinced me to stay an extra night, which gave us the opportunity to rest our legs and visit nearby Korçë. Despite the heat, we enjoyed exploring the quaint parks and back streets of the city. After many years of decrepitude following the fall of communism, the place has recently been experiencing a rebirth and many old buildings and streets have been renovated (partly with the help of European Union financing). The main Orthodox Church in the center looked very impressive. Our only regret is not to have visited the Korca Brewery, probably the most famous beer in the country (up there with Tirana). A lone bunker in a field. 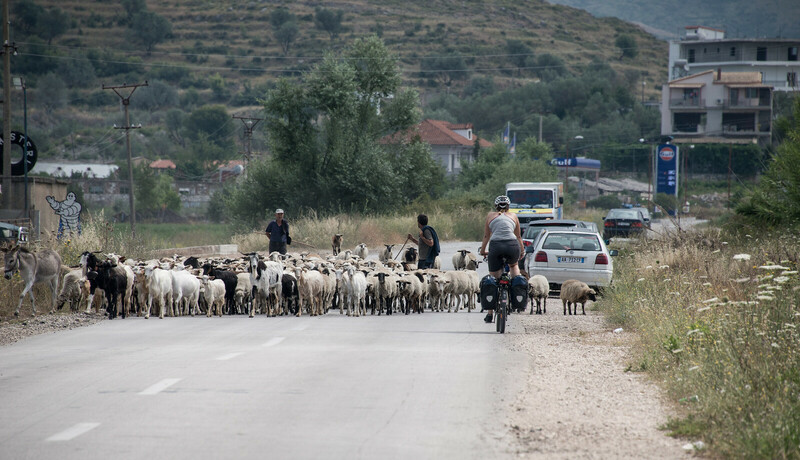 This is a very common sight in Albania. 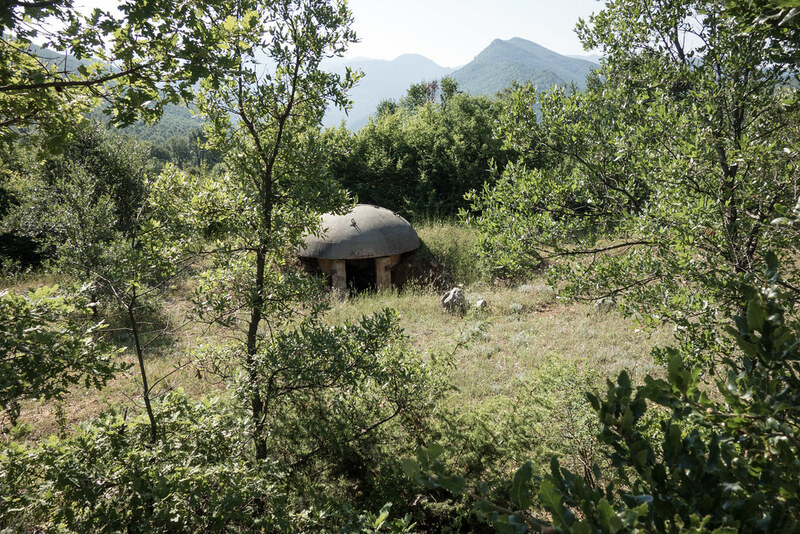 It is estimated that around 700.000 bunkers were built all over Albania during the rule of communist dictator Enver Hoxha after WWII to protect the country from an Soviet Union or US invasion. That’s on bunker for every 4 inhabitants! 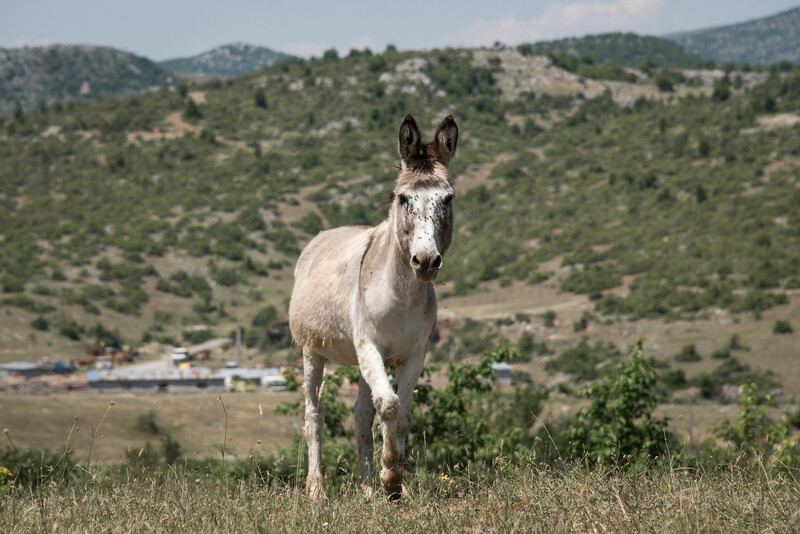 There are MANY donkeys in Albania. 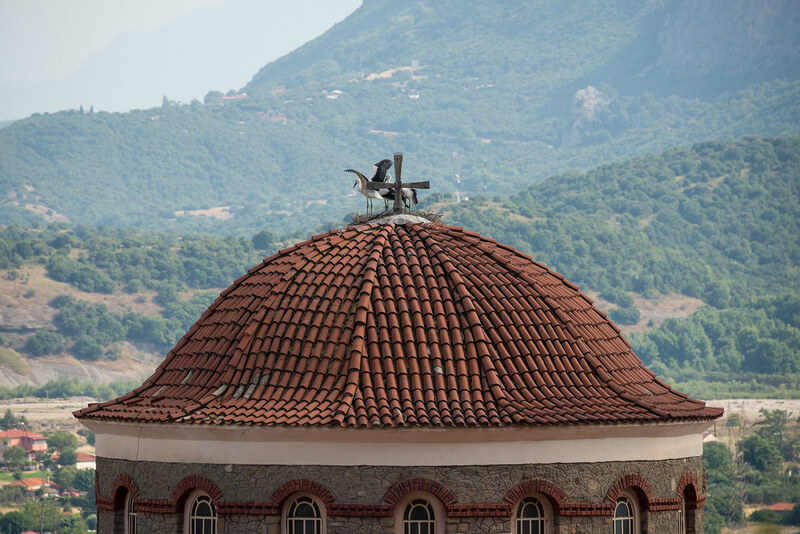 Beautiful Orthodox Church in Korçë. Going fishing… We passed this friendly Albanian man and his fishing companion just outside of Korçë on our way back to Kamenicë. A few kilometers later both men accelerated and overtook us, only to slow down again once in front of us. As we passed them again I noticed the big grin on their faces, both of them ready to overtake us again. They were playing with us and by the looks of it having a blast. 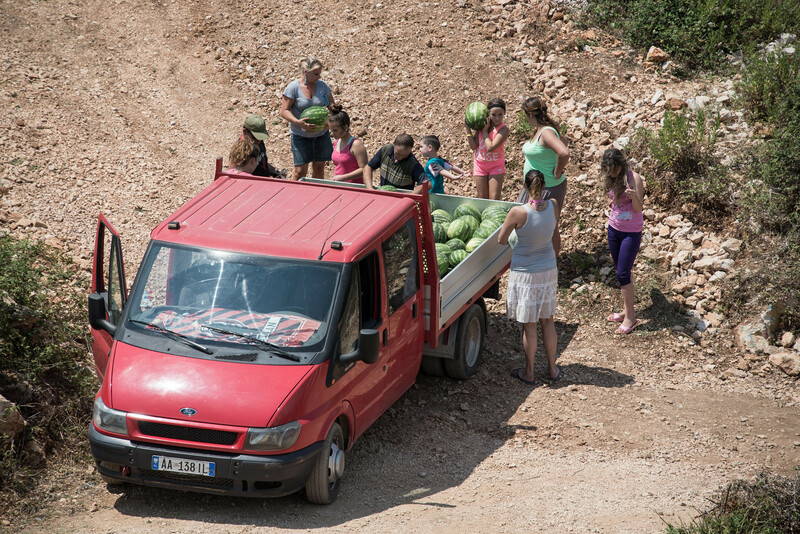 This game went on until we arrived at the turn off to Kamenicë, where they waved us goodbye. 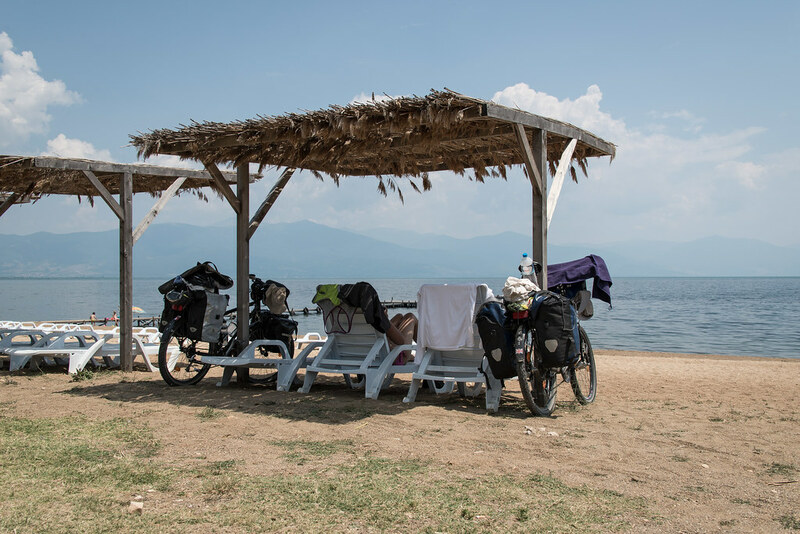 We left the hotel early on the second morning and by 08:00 had already covered the 30 km to the beginning of the climb that would take us to the Prespa Lakes. 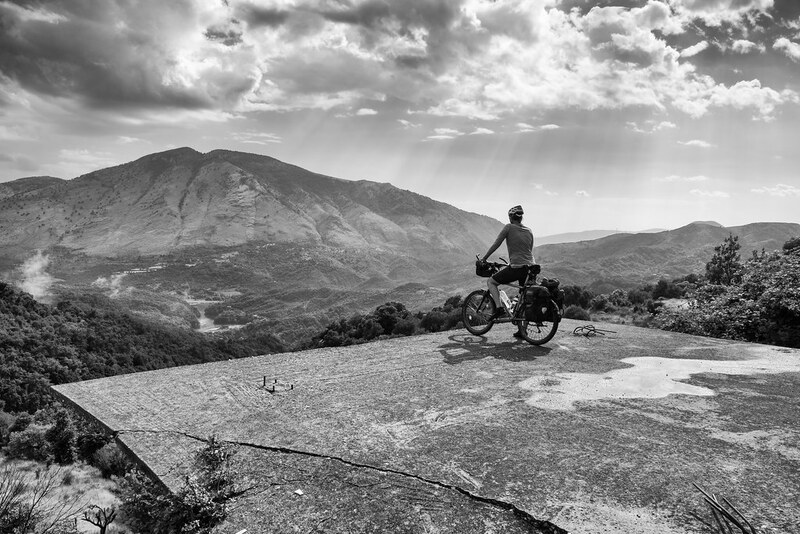 It was our first time cycling more than 5 km on continuous flat roads since starting the trip… The top of the Qafa e Zvezdës pass marked the beginning of the Prespa National Park, an area belonging to UNESCO’s World Network of Biosphere Reserves. 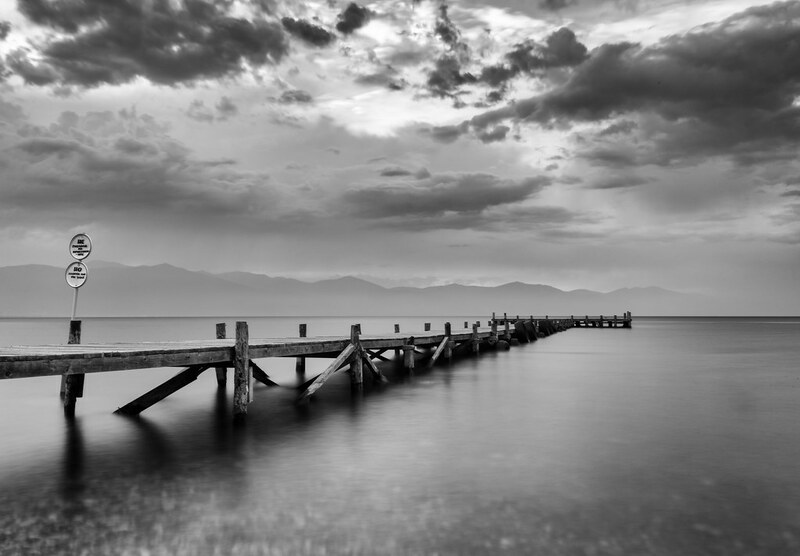 The scenery was amazing, with the Mali i Thatë Mountain Range on our left and the Small Prespa Lake on our right. 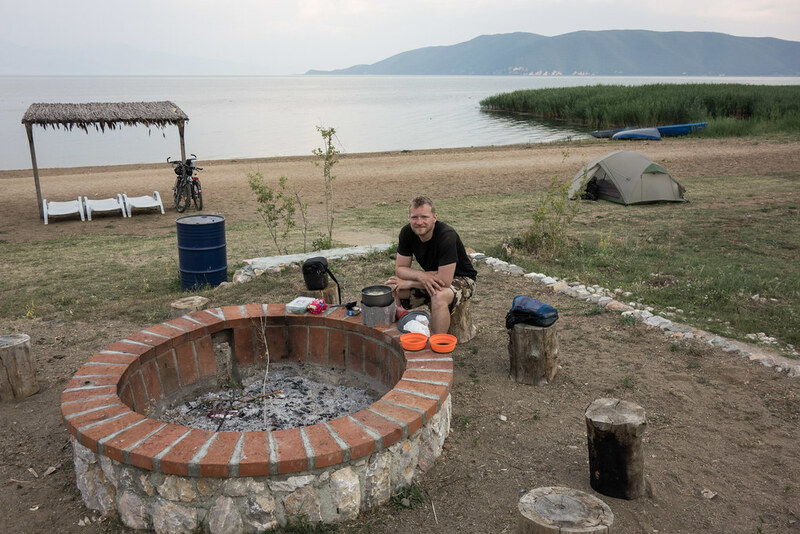 We followed the scenic road all the way to the Macedonian Border and pushed on to the small town of Oteshevo, where my map indicated a campsite. There was indeed a campsite by the lake, but it looked completely abandoned and run down, so we decided to continue north until we reached some kind of hotel resort. I asked a young and friendly waiter if there was anywhere in the vicinity where we could set up our tent and to our delight he pointed to the beach and said we could camp there for free. The waterfront was almost empty, with just one family sunbathing near a long pier. It was nice for once to finish the day early and end up in a beautiful and quiet location. That afternoon remains one of my best memories of the trip; we settled on two loungers underneath a wooden roof and spent the rest of the day jumping off the pier in the warm lake waters (me) or simply reading and relaxing on the loungers (Angela). Not a worry in the world. 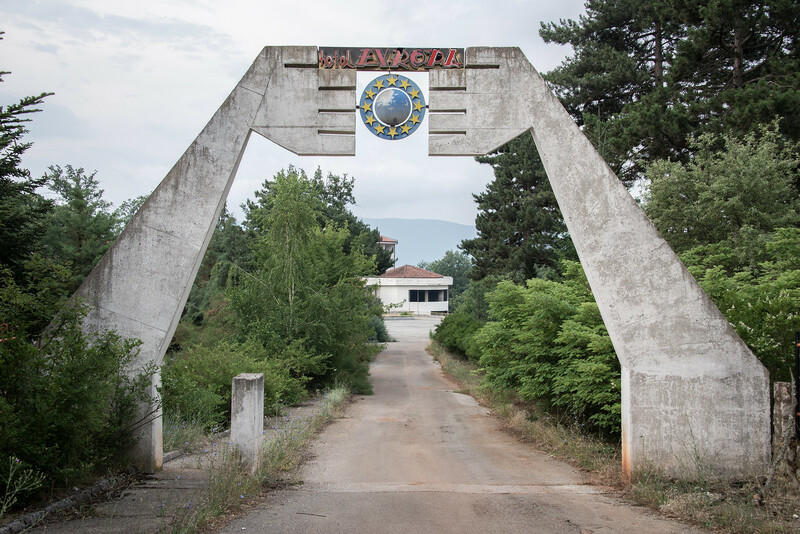 The entrance gate to the abandoned campsite resort, communist architecture at its finest. In the late afternoon we started hearing thunder in the distance. 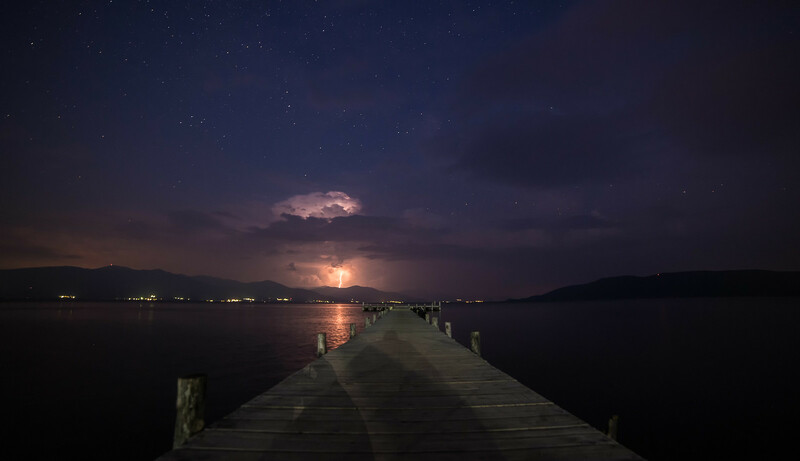 By nightfall the storm had reached the eastern shores of lake Prespa, offering a wonderful display of thunderbolts.